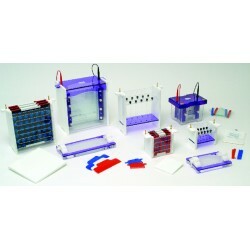 Electrophoresis Gel Tank Units There are 6 products. The Select BioProducts Horizontal Gel Electrophoresis Systems are designed for ease of use and durability. With an extensive off ering of combs and accessories these horizontal systems are ideal for most DNA electrophoretic applications. The gel trays are UV transparent for easy visualization of samples. 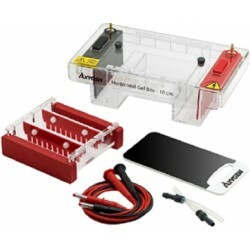 Th e MiniGel II Electrophoresis System is supplied complete with all components needed for casting and running agarose gels: two gel casting sets, gel tank and attached power supply.